Lemuel Gulliver, a ship's surgeon and intrepid adventurer, couldn't manage to stay home with his wife and children. He might remain for a few months, but then always got enticed back into a job on a ship, usually as the resident doctor. Unfortunately this rarely worked out for him long-term, and he became stranded in one strange place after another, having to learn new languages and adjust his expectations to fit the needs of the people he was stranded among. While interacting with the strange races of people (or creatures) he learned from them, and observed many nonsensical pursuits which, applied to our own human society, show how fruitless and needless some of our own endeavors are. Gulliver's Travels is a grand satire on the shortcomings of the human race, with particular attention to the political, religious and academic nonsense that distracts us from what could otherwise be a peaceful and virtuous existence. I wish I had enjoyed the book more but some parts of it were offensive, and his attitude toward women shocked me. As for the many satirical elements of his narrative, I honestly didn't understand them all and wondered if I needed to do a lot of research into 18th century Irish politics to be able to grasp every nuance of the novel's value. In general, a lot of the satire was directed toward the human race as a whole or specific occupations, and that was easier to comprehend. I'm giving the book only 4 stars because of the offensive elements. Though this is a short book I became bored by part three, and stalled for months. Eventually I picked it back up again and discovered that part 4 was my favorite - his experience in the land of the Houyhnhnms where he lived in happiness and peace for five years, with brief unhappy contact with the Yahoos, evil creature that they were. Unfortunately, we are all Yahoos, but can take lessons from the Houyhnhnms if ever we are fortunate enough to find ourselves in close proximity to them, and if ever we have the good sense to listen and learn. I enjoyed perfect health of body, and tranquillity of mind; I did not feel the treachery or inconstancy of a friend, nor the injuries of a secret or open enemy. I had no occasion of bribing, flattering, or pimping, to procure the favour of any great man, or of his minion; I wanted no fence against fraud or oppression: here was neither physician to destroy my body, nor lawyer to ruin my fortune; no informer to watch my words and actions, or forge accusations against me for hire: here were no gibers, censurers, backbiters, pickpockets, highwaymen, housebreakers, attorneys, bawds, buffoons, gamesters, politicians, wits, splenetics, tedious talkers, controvertists, ravishers, murderers, robbers, virtuosos; no leaders, or followers, of party and faction; no encouragers to vice, by seducement or examples; no dungeon, axes, gibbets, whipping-posts, or pillories; no cheating shopkeepers or mechanics; no pride, vanity, or affectation; no fops, bullies, drunkards, strolling whores, or poxes; no ranting, lewd, expensive wives; no stupid, proud pedants; no importunate, overbearing, quarrelsome, noisy, roaring, empty, conceited, swearing companions; no scoundrels raised from the dust upon the merit of their vices, or nobility thrown into it on account of their virtues; no lords, fiddlers, judges, or dancing-masters. 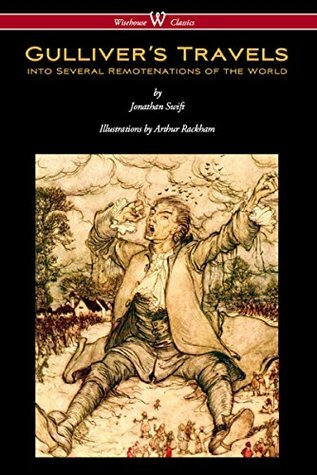 Though Lemuel Gulliver's travels eventually came to an end (with generations of readers thinking, "Thank God" ... his lessons, however satirical, snarky, and ridiculous (or ridiculously offensive) live on to offend and enlighten whoever dares to experience the joy of reading this classic book. Sign into Goodreads to see if any of your friends have read Gulliver's Travels.